House And Senate Reach Deal On Sanctions For Russia, Iran And North Korea : The Two-Way The sanctions would punish three countries; the bill also aims to prevent President Trump from relaxing sanctions without lawmakers' consent. A House vote is expected on Tuesday. House Majority Leader Kevin McCarthy says the sanctions will show those who work against America's interests that their "actions have consequences." Congress will consider imposing new sanctions on Russia and Iran as well as North Korea, after Republicans and Democrats agreed to changes that will allow the legislation to move ahead. The bill also aims to prevent President Trump from relaxing sanctions without lawmakers' consent. An earlier form of the sanctions legislation had sailed through the Senate with a 97-2 vote last month. But that legislation focused only on Russia and Iran. It then lost momentum in the House after representatives said they wanted to include North Korea. That conflict has been resolved, lawmakers say. A vote is expected in the House on Tuesday. On the same day, the Senate Foreign Relations Committee has scheduled a hearing on assessing U.S. policy toward North Korea. 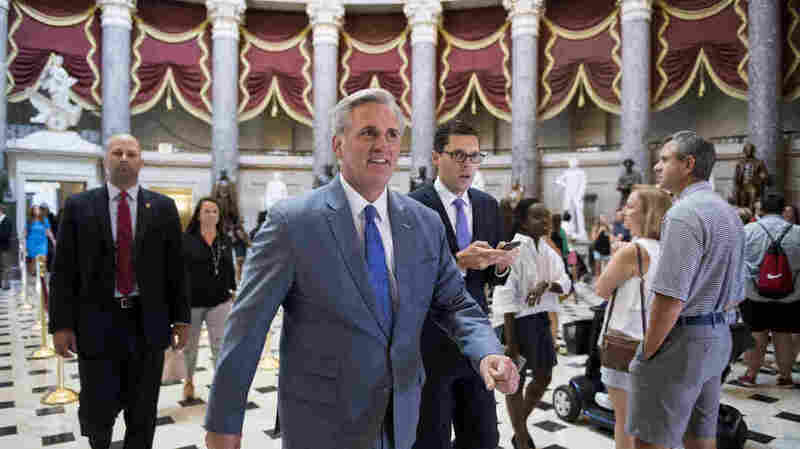 "Those who threaten America and our interests should take notice — your actions have consequences," House Majority Leader Kevin McCarthy said in a tweet as news of the agreement emerged on Saturday. The sanctions bill "will hold Russia and Iran accountable for their destabilizing actions around the world," Democratic Whip Steny Hoyer of Maryland said. "The legislation ensures that both the majority and minority are able to exercise our oversight role over the administration's implementation of sanctions." Lawmakers are looking to approve the sanctions before leaving Washington for the August recess. Suggesting strong support for the new bill, McCarthy and House Foreign Affairs Chairman Ed Royce issued a joint statement in which they noted that in May, the House voted 419-1 to impose sanctions on North Korea. The two California Republicans say the revised bill has a range of targets, including North Korea's ballistic missile system. They also said the sanctions have been modified to prevent side effects that would have benefited what they called Russia's "energy oligarchy," while also addressing concerns of European countries that have said sanctions could threaten their access to energy resources. It's not known how Trump might greet the legislation if it reaches his desk. He could sign it or veto it — something that would risk both public criticism and the chance that Congress might override his veto with a two-thirds vote. Earlier this month, White House Legislative Affairs Director Marc Short said the legislation regarding congressional approval was written in a way that no administration, Republican or Democratic, would support. Short said the legislation would set "an unusual precedent of delegating foreign policy to 535 members of Congress by not including certain national security waivers that have always been consistently part of sanctions bills in the past." The U.S. has a long history of imposing sanctions on Russia — including the seizure by the Obama administration of two diplomatic compounds in the U.S. But as NPR's Greg Myre recently reported, "Critics say the two countries should be focused on matters like the war in Syria and the turmoil in Ukraine."